My practice piece. First attempt at the left was too loose. Second attempt was good and tight. 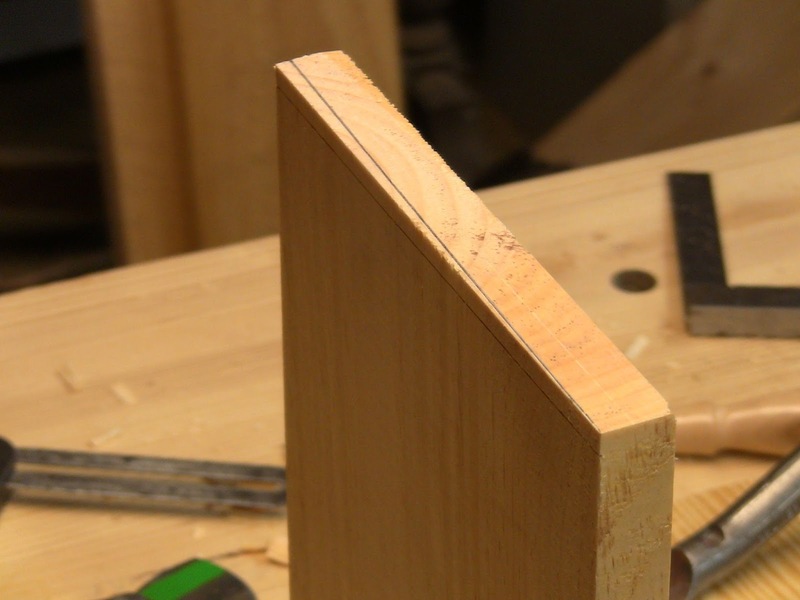 A project I'm currently working on calls for sliding dovetails. This is something I'd only briefly tried in the past, so I wanted to be sure I had the process down. 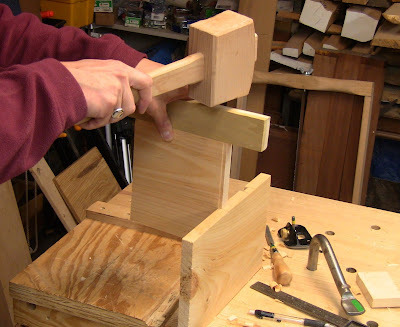 Roy Underhill shows two variations in The Woodwright's Shop, in seasons 12 (1992, "Moravian Chair") and 31 (2011, "The Case For Books"). I largely followed his method, but I also adapted one of the jigs from Graham Blackburn's excellent new book Jigs And Fixtures For The Hand Tool Woodworker , a dovetail chisel guide. 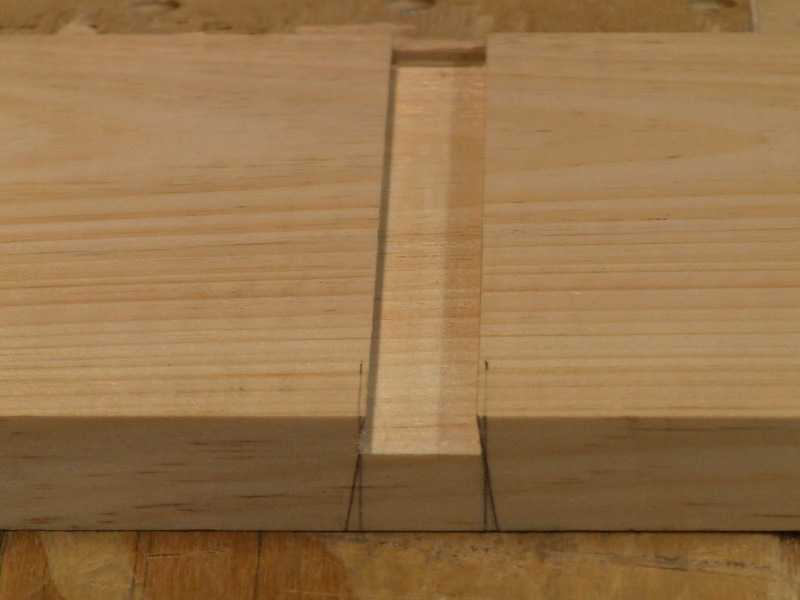 I made the dovetail 1/4" deep in 3/4" stock. 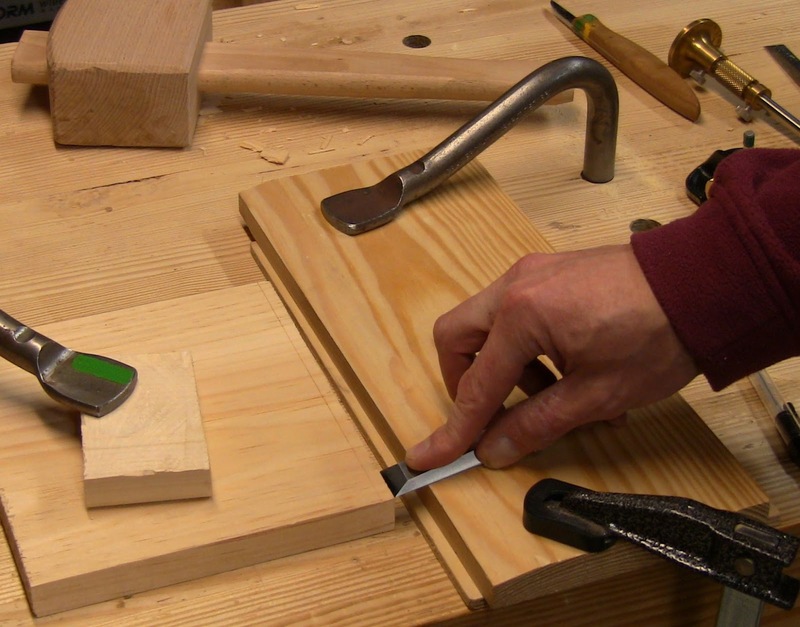 The socket is essentially a dado with angled sides. The only extra step is the marking of the dovetail angles for sawing. 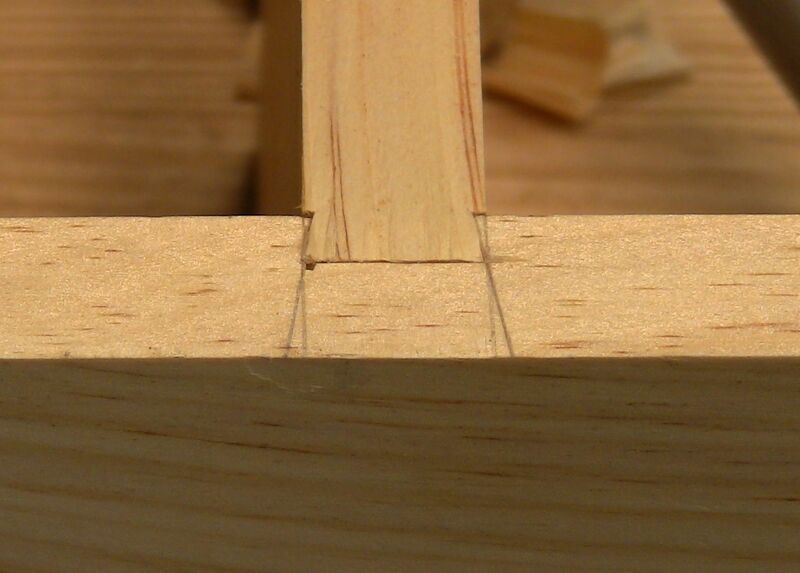 I used a 1:6 dovetail angle, which I have conveniently marked on my wide bench hook so I can set my bevel gauge. Marking the socket depth in the edge, running between two faint lines showing the width of the other piece. I darkened the mark with a pencil for visibility. 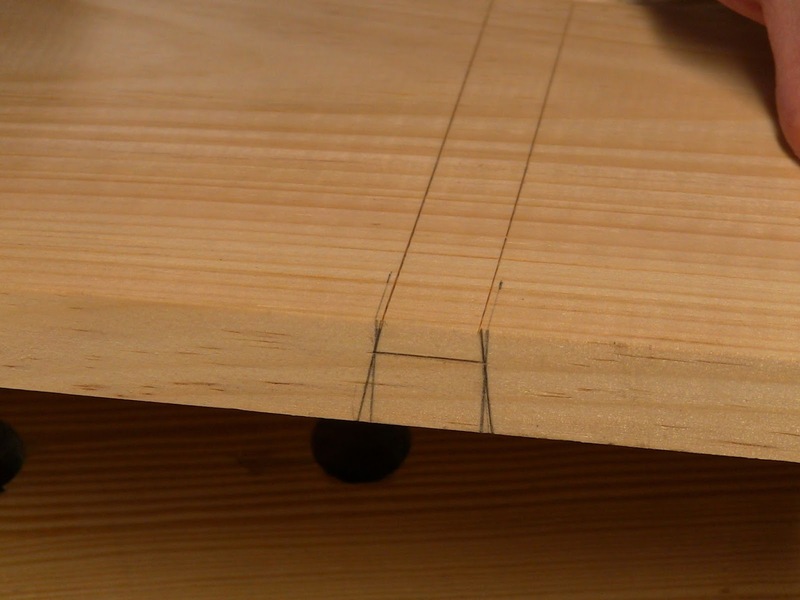 Setting my bevel gauge to the 1:6 dovetail angle I keep drawn on my bench hook. 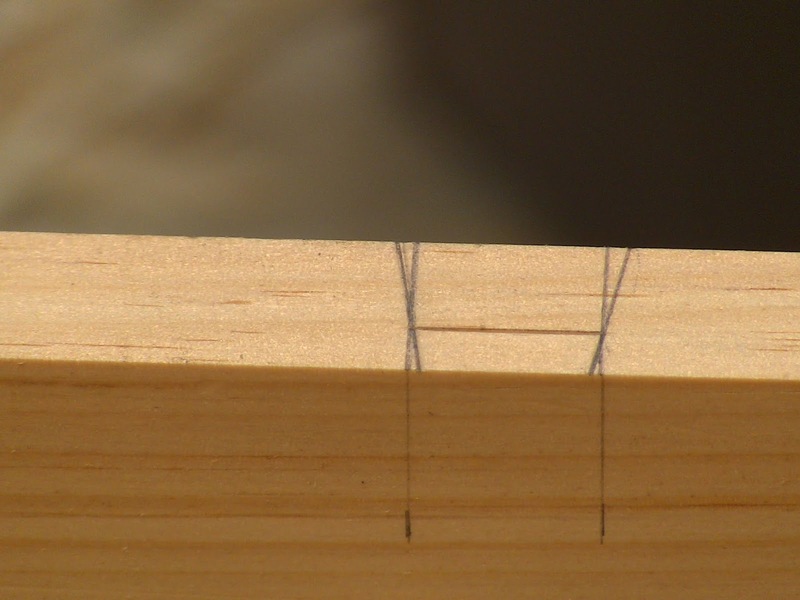 Marking the dovetail lines on the edge, crossing the gauge line exactly at the width lines for the other piece. 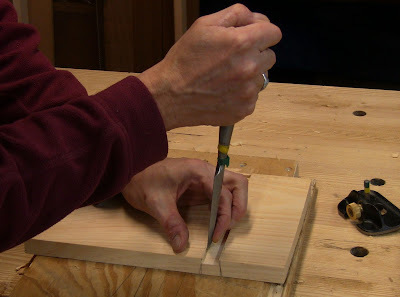 Marking the lines for the tops of the socket walls with a knife. I scribed several passes for a deep mark. The fully marked edge and face. I marked the far edge for depth with the marking gauge. 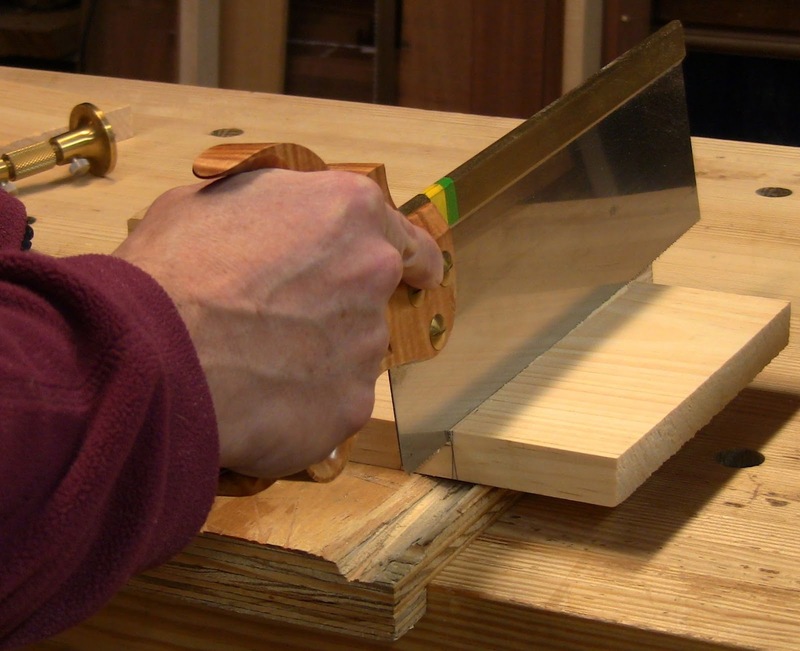 Running a chisel down the waste side of each knife line to form a trough for the saw. 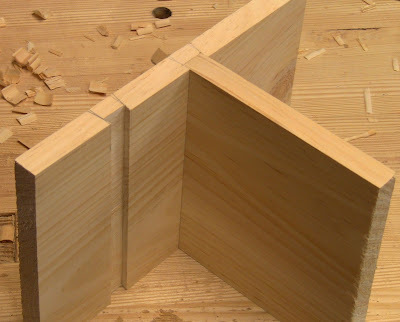 Sawing the socket walls is just like sawing dado walls, except that you have to tip the saw to the dovetail angle. 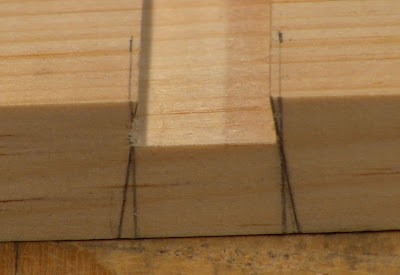 By sighting down from the back of the saw to the dovetail lines on the edge, I was able to see the correct angle, just like sawing regular dovetails. As with those, I sawed to the waste side of the marked line. Sawing the first wall using a bench hook. 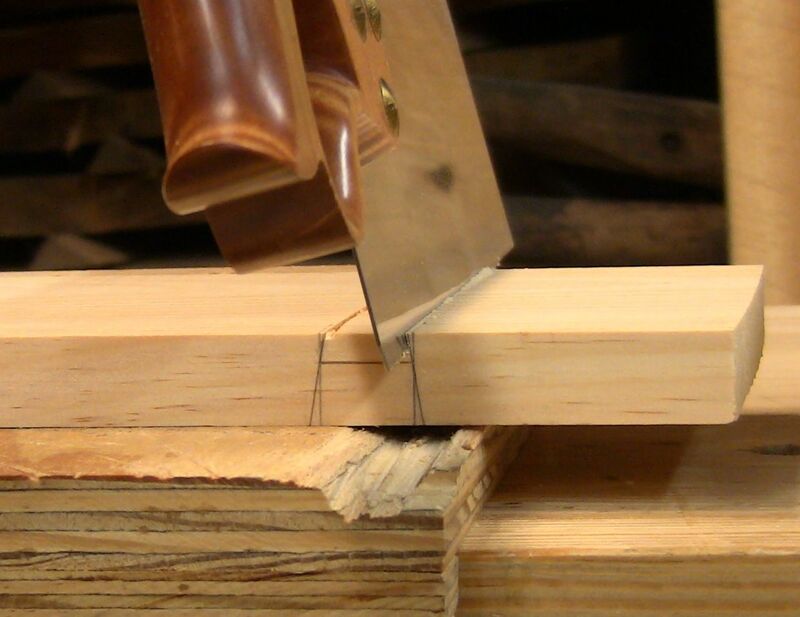 Closeup of the saw pitched over to the left. The sawn walls. The left wall cut looks a bit wide of the line. To remove the waste, I popped the chisel in at each edge, just above the gauged line, to ensure that I wouldn't blow out the wood when coming across from the other direction. Then I rolled up the bulk of the waste from each edge into the middle. That's fun! I finished off with a small router plane set to the proper depth. 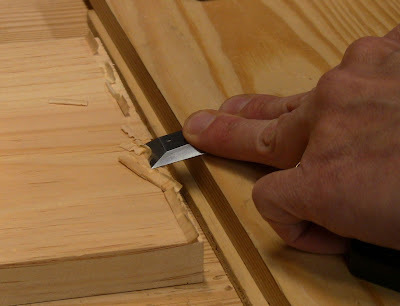 Popping the chisel in at the first edge. Do it in several layers. Rolling up the waste toward the middle, again in several layers. 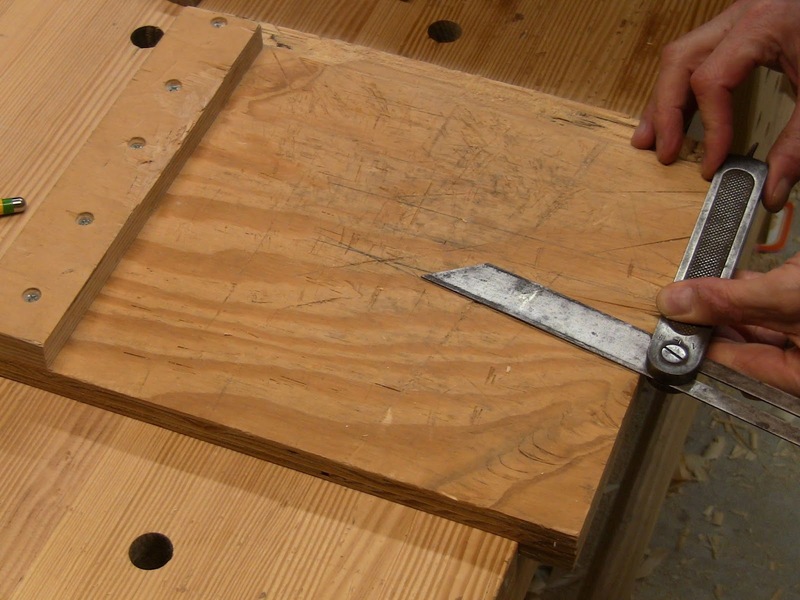 Routing to final exact depth. Cleaning up some unsawn fibers in the corner. The completed socket with smooth bottom. Closeup of the socket end. That left wall has definitely gone past the width line. 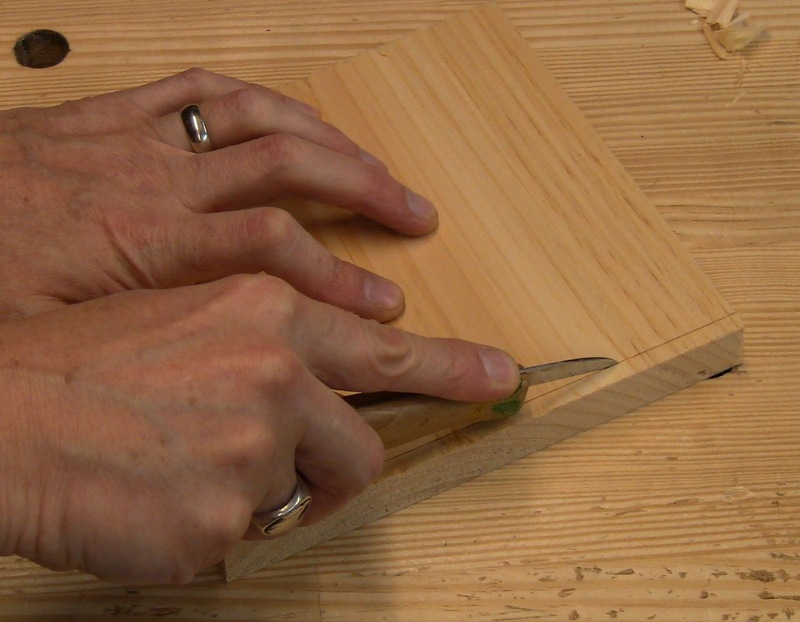 The tongue is a completely new operation, not really anything like a regular dovetail or dado. As you can see in the photo above, the shoulders of the socket are very narrow, so I just marked and knifed them to the approximate depth, no sawing required. Marking down the edge to the depth of the socket. This needs to be a precision shot edge. Deepening the line with a knife. 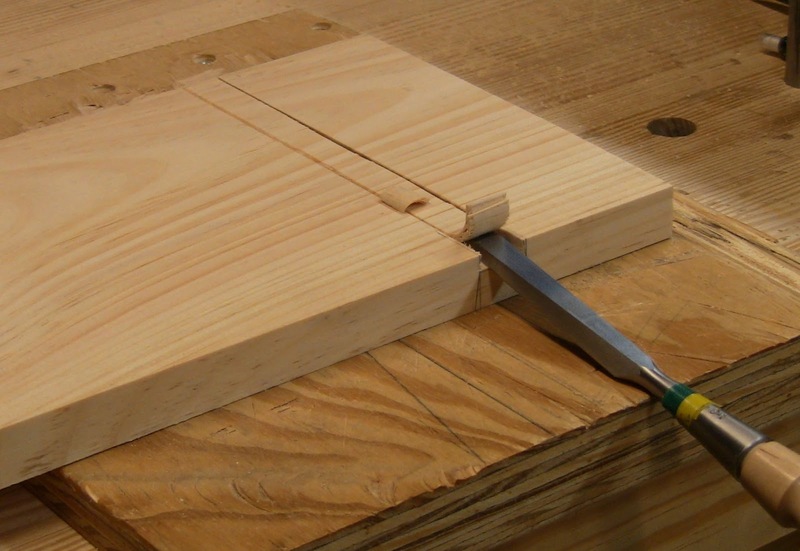 This is all the crosscutting required. The real challenge here is cutting the sides of the tongue at the dovetail angle so that it matches the socket. 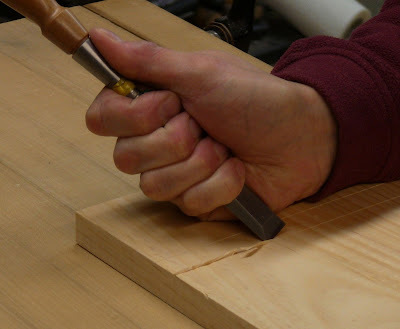 I tried a few totally freehand, carefully running the chisel down the edge at an angle. This produced a functional joint, in that it had the dovetail wedging action, but I couldn't match the angles reliably. This compromised the fit and strength as well as the appearance. The dovetail chisel jig Blackburn shows is a block with the end cut down to the dovetail angle. 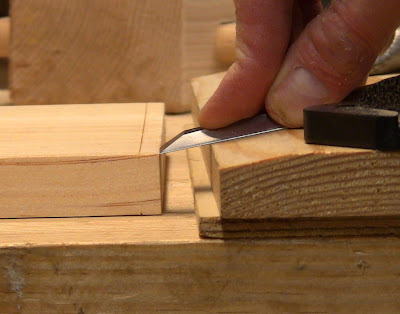 You run the chisel flat across this angled face into the endgrain of the dovetail tongue. 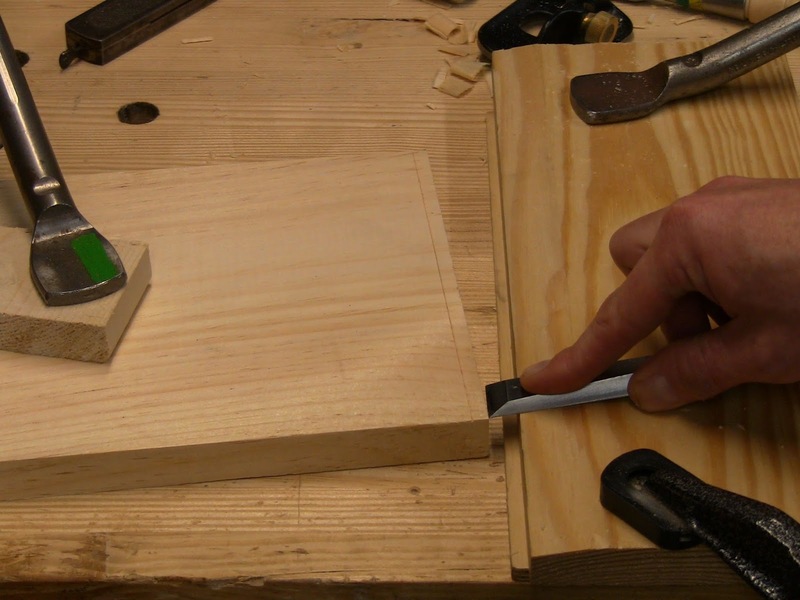 I adapted this slightly, planing the edge of a board to this angle, so that I could set up the board in one spot and move the chisel along it. 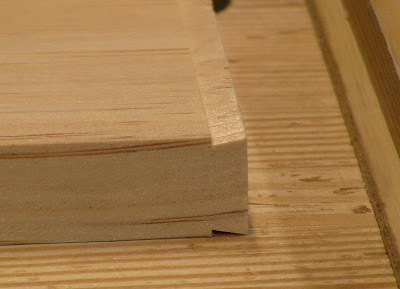 Guide board with edge planed to dovetail angle. Positioning the guide board so that the chisel just meets the end grain corner all along the width of the workpiece. The guide board is sitting on a piece of 1/4" plywood to raise it up a bit. 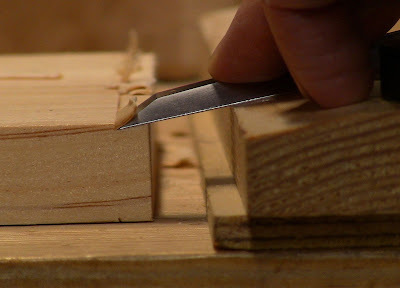 With the chisel flat on the guide face, it just meets the corner of endgrain and face. Pushing in for the cut, down to the knife line. This can be done in several layers to get to full depth. 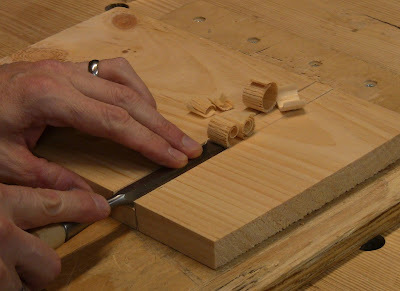 Working the chisel into the end grain all the along the width of the board for the final layer of waste. Run a knife down the inside corner to free any uncut fibers. The completed tongue, ready for dry fit. The angles match nicely, but the socket is too wide. The tongue just drops in with no resistance. It would actually hold mechanically, and glue would swell the fibers to help close up the gap, but this is too loose a fit. Since this was just a practice piece, I made a new socket next to the first one, but far enough away to avoid any splitting. This time I took more care to saw to the wast side of the lines. The results were much better. The fit was tight enough to require a mallet to drive it home (verging on too tight, but you can always pare away another layer if you need to). Driving the tongue down into the socket. A good tight fit. 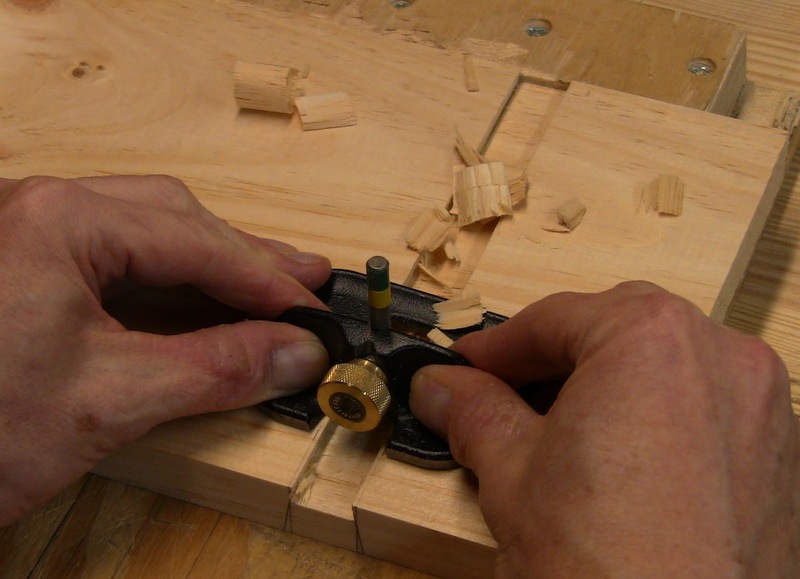 Even without glue, this won't come apart on its own. This joint is surprisingly fast to make. It's worth practicing a few times to get it down. 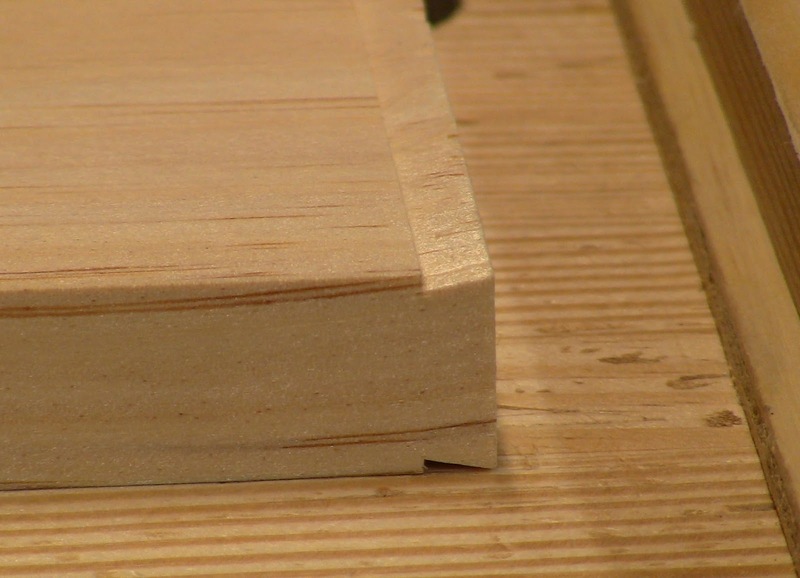 Worst case, a little glue mixed with sawdust will fill tiny gaps for perfect appearance. 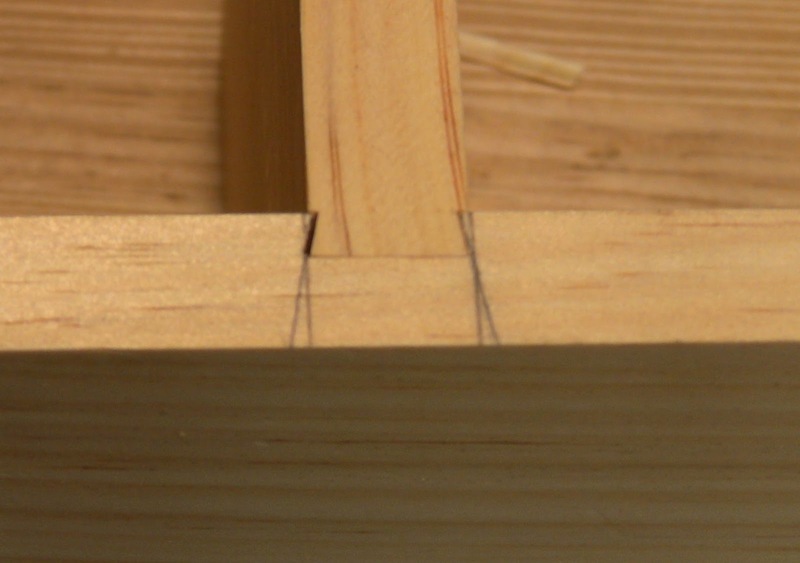 The chisel guide is a huge help for consistent angles. 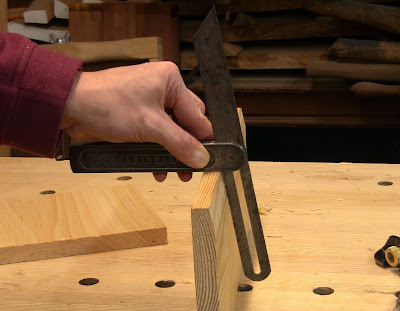 This was for regular non-tapered sliding dovetail. 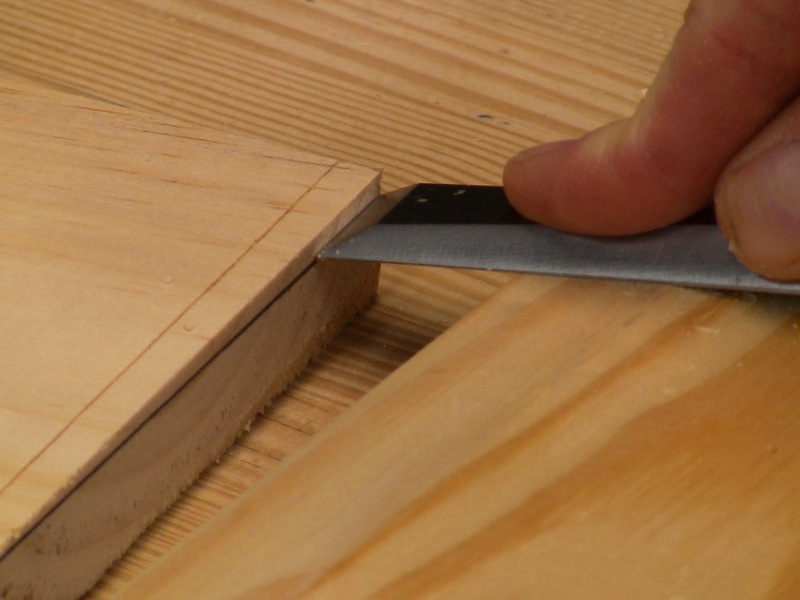 Need a tapered sliding dovetail? 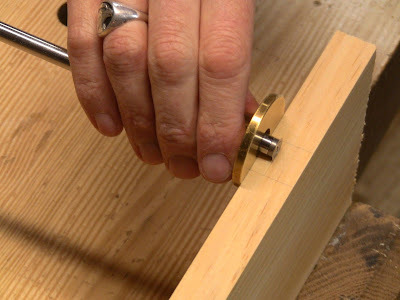 As Roy showed, you skew one knife line for the socket inward by 1/8" at the far end so it makes a long gradual taper. Similarly, you draw a matching skew line on the end grain of the tongue piece. The chisel guide piece isn't tapered, but you achieve a tapered cut simply by skewing the guide piece itself away from the end grain. 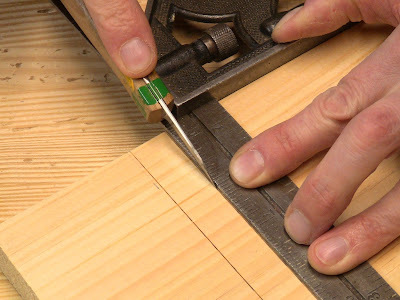 Line it up so the chisel contacts the corner of end and face grain at one edge, and contacts the skewed line drawn on the end grain at the other edge. 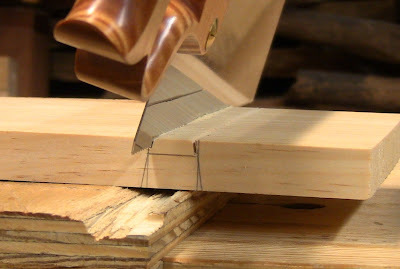 Skewed line drawn across the end grain of the tongue. 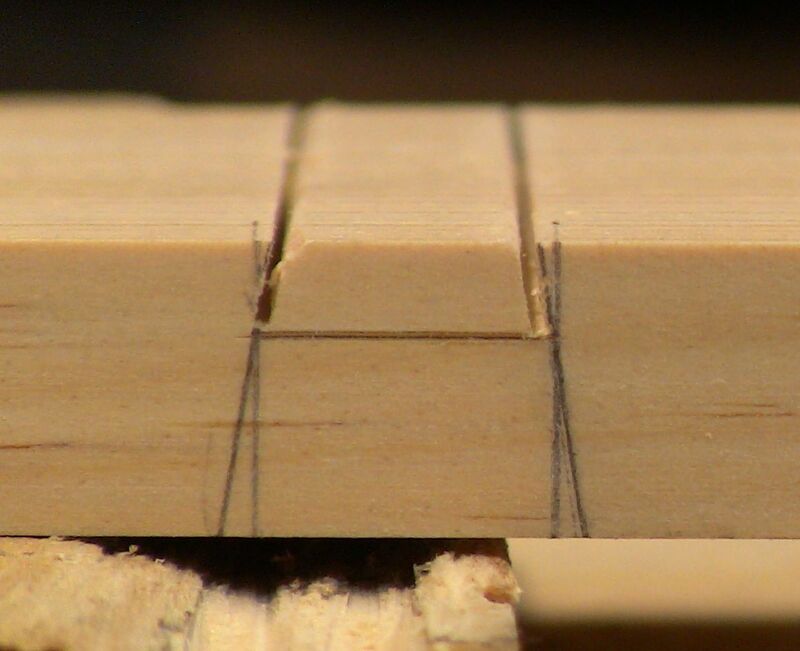 Lining up the near edge of the tongue, as above for the non-tapered dovetail. 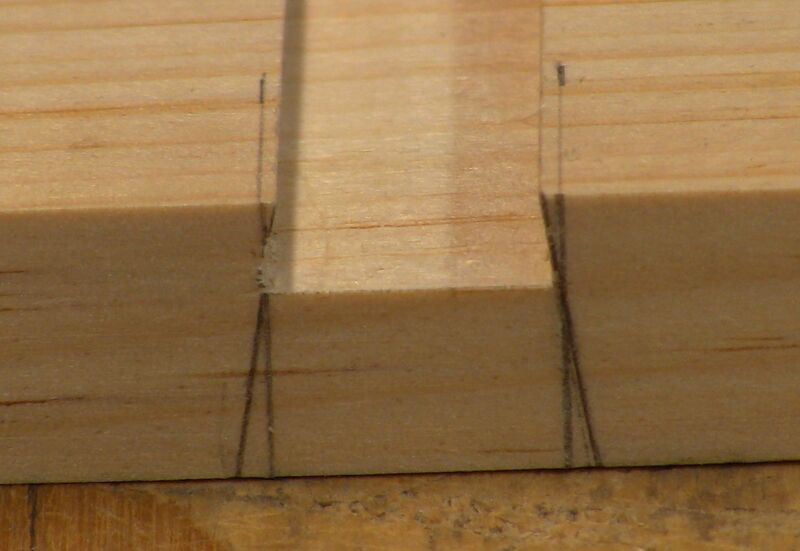 Note how the workpiece splays away from the guide piece to achieve the tapered cut. 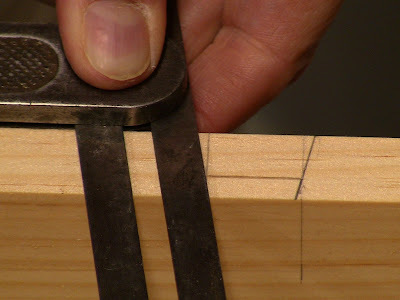 Lining up the far edge of the tongue, so the chisel contacts the skewed line. The tapered joint is really no more difficult than the non-tapered joint. 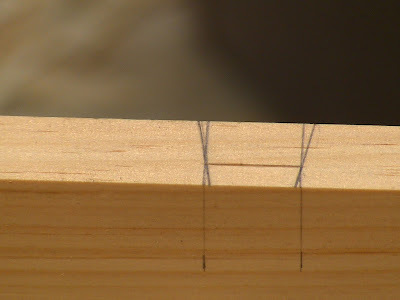 It just requires one extra mark, the end grain skew line. All the rest of the setup, alignment, and cutting are the same, just to the skewed lines. 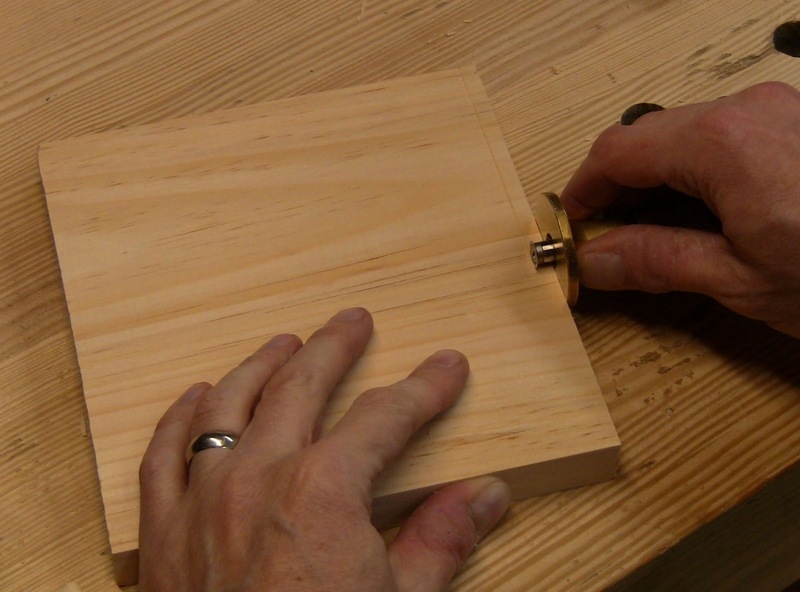 The fit is a bit more finicky, since you want the sliding action to wedge up tight at a specific point. Make it stop early, then very carefully take a few tiny parings to be able to drive it in further to the stopping point. Impressive. I didn't see you make a tapered dovetail slot like Roy did on his or did I miss that? And thanks for the tip on the new book by Graham. That will be another xmas gift to me from myself. Thanks, Ralph! This was not a tapered one. I added a brief section on those at the end. Thanks for this. My wife's put a project on the list that is going to need some sliding doves. I watched Roy's video last week and have been scouring the net for any other examples. Some good tips here. I made a couple practice ones too, and they didn't come out bad, but eventually I'll need to do the real deal.